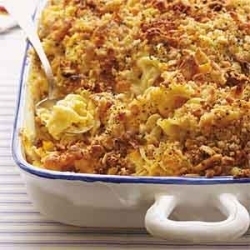 Combine chicken, noodles, sour cream, soup and cheeses in a large bowl. Pour into a lightly greased 13″x9″ baking dish. Mix together cracker crumbs and margarine; sprinkle over top. Sprinkle poppy seed over cracker crumbs. Bake at 350 degrees for 25 to 30 minutes or until crackers are crispy and golden and cheese is melted.